There are Many over 55 Communities in Florida. Why Choose Lake Griffin Harbor in Leesburg? Excellent location – Our 55+ community is directly adjacent to Lake Griffin, one of the biggest lakes in Florida and part of the Harris Chain of Lakes. Prime lakefront real estate makes Lake Griffin Harbor the ideal community for retirees 55 and over who enjoy boating, fishing, and wildlife observation. Lake Griffin is a healthy bass fishery as well as a habitat for a wide range of other animal species. Few other over 55 communities in Florida offer a lakeside setting as spectacular as ours. Affordable homes – All our homes are high-quality, custom-built structures designed with affordability and maintenance-free living in mind. 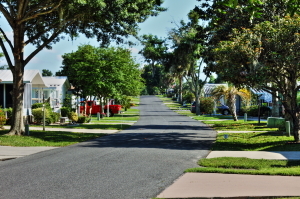 Click here for an updated listing of the pre-owned manufactured homes for sale at Lake Griffin Harbor in Leesburg. Spacious clubhouse – Our spacious lakeside clubhouse is full of excellent amenities that are for the exclusive enjoyment of our residents and their guests. There is a fitness center, banquet hall, library, billiards room, heated outdoor pool with screen, horseshoe pits, 55-slip marina, boat ramp – the list goes on. Welcoming atmosphere – Living at Lake Griffin Harbor means always being able to interact with friendly neighbors and to lead an active retirement lifestyle alongside others who wish to do so, too. Here, you will become fast friends with other retirees from all walks of life. Contact us today if you’d like to learn more about what Lake Griffin Harbor in Leesburg has to offer and why it’s justifiably been called one of the top over 55 communities in Florida.